Timecard Buddy is a form filling app. A number of common payroll company timecards have been scanned into Timecard Buddy and are accompanied with entry buttons for each field on the timecard. Timecard Buddy then renders every entered value into an image of the timecard and exports it as a pdf or png file. 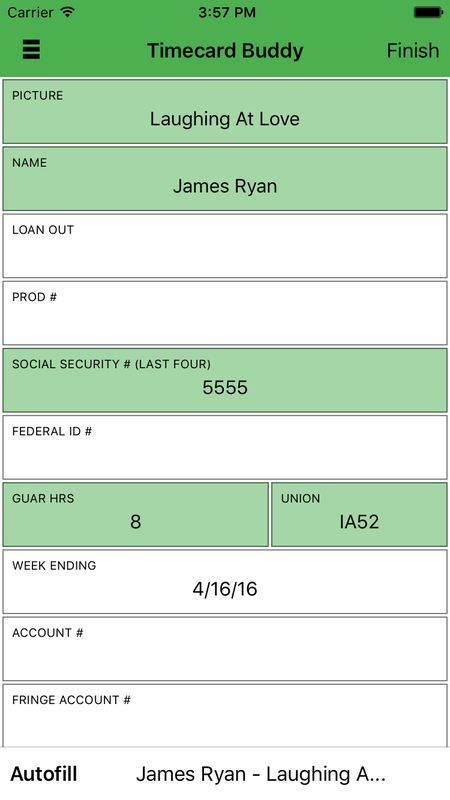 Timecard Buddy aims to make the transition from paper to digital as transparent as possible. This focus is what guides Timecard Buddy's "enter-here, appear-there" mechanism. The user is responsible for all fields that appear on the resulting pdf. To assist in entering fields, TCBuddy allows users to save a set of fields to be easily recalled from week to week. Selecting Autofill mode causes subsequent entries to be saved in a template. These templates can be recalled individually or collectively when a group of timecards are created, all at once. TCBuddy has an easy to use interface for handling an entire department of timecards. 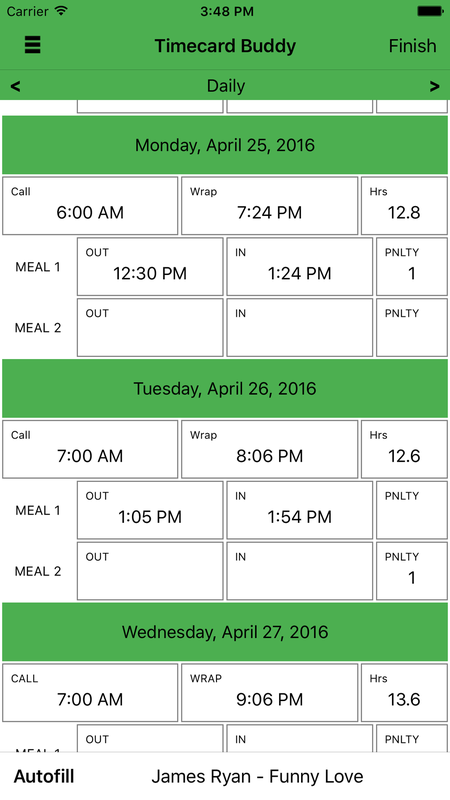 Timecards are automatically grouped by Production and Week Ending and all grouped timecards appear in a list with the most imminent daily fields: Call, Lunch, Wrap, and Penalties. In addition, one set of daily fields can be entered as Default values for every timecard in the group. By default, every timecard adopts these values, but any given timecard can overwrite a default value or opt-out of default values entirely. TCBuddy provides an email export that will report the Call, Lunch, Wrap, and Penalties fields for all group employees in a given day. TCBuddy maintains that the user is responsible for what appears on final export of his timecard. Other than dates, no field is automatically entered for the user. However, TCBuddy does provide calculated hints for certain fields. 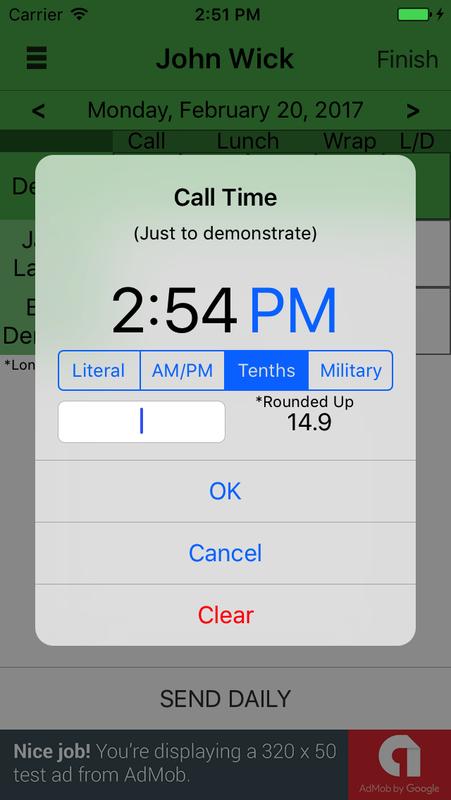 For example, the Total Hours field provides the calculation of the total amount of time between Call and Wrap, as well as that time with 30 mins and 60 mins subtracted. The user then chooses how much time to take off for lunch. TCBuddy provides entry for fields that do not appear on the final document. These fields allow the user to more easily calculate an estimate of the sums he expects to see on the resulting paycheck.